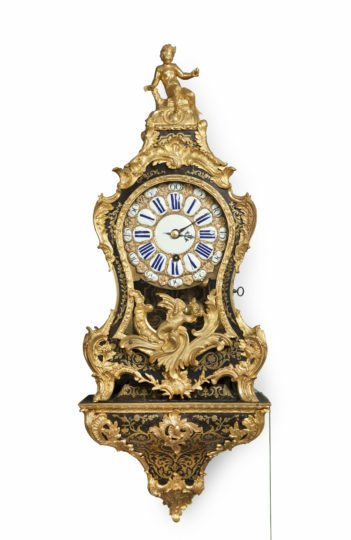 The two-week spring-driven movement of this console clock has a going train only. 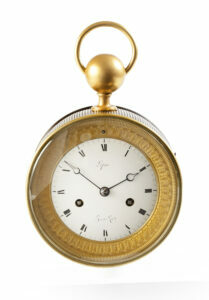 It has verge escapement and short pendulum. 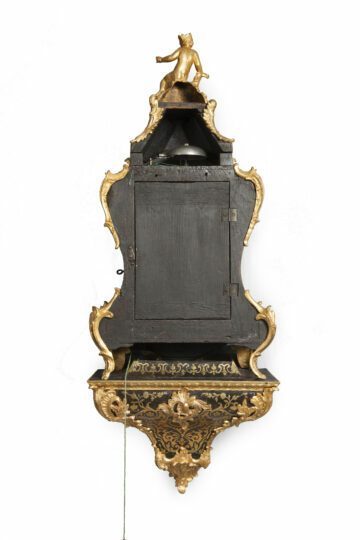 In addition, it has pull quarter repeat, activated by pulling a chord to the side of the clock. The backplate is signed and numbered by the maker Pelletier H.ger du Roy AParis No. 297. 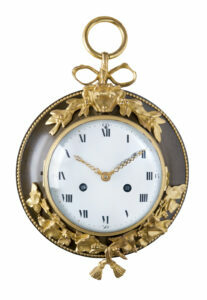 The gilt cast-brass dial has twelve enamelled cartouches with blue Roman hour numerals. Around this ring there is another enamelled cartouche ring with Arabic numerals, being five-minute divisions, whilst the minutes are indicated by strokes in the cast dial. In the middle there is a large enamel disc. The time is indicated by a pair of blued-steel hands. The waisted walnut and tortoise-shell veneered oak case and bracket are embellished by gilt cast-brass leaf-vine ornaments and Boulle marquetery. The waisted glazed gilt-brass door protects the dial and serves as a pendulum aperture. The bottom of the door frame is adorned by a cast dragon motif. The sides have glazed windows, whilst the case is surmounted by a cockerel. All bronzes are marked with a ‘C-couronné’. This stamp was there for tax purposes, as tax had to be paid on all bronzes and other copper alloys in France which were produced or retailed in the period between March 1745 and February 1749. Because of this the clock can be accurately dated. Literature: Tardy, Dictionnaire des Horlogers Français, Paris, 1972, p. 507. 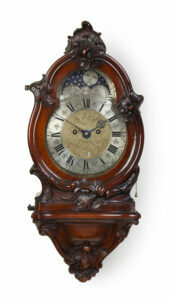 Pelletier was a descendant of a well-known clockmakers family. He became a master in 1776. 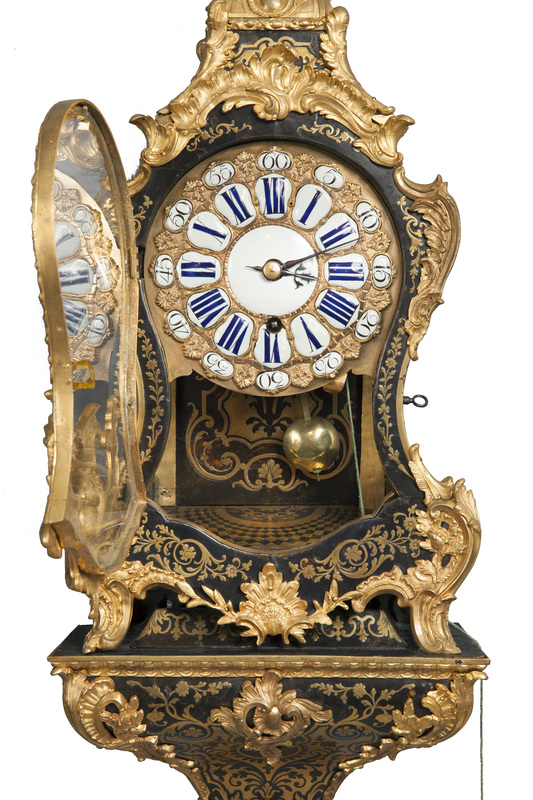 Pelletier was clockmaker of the King in Versailles and was active or lived at the rue d’Anjou in Paris in 1783. 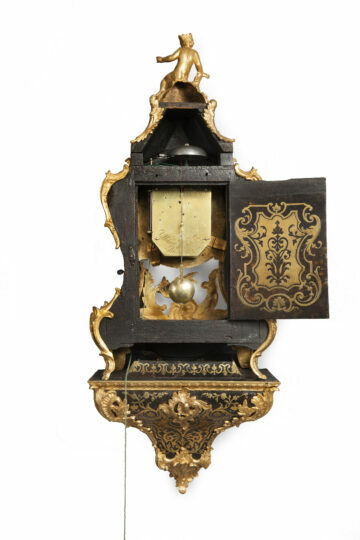 He signed his clocks: Pelletier horloger du Roy.